This incredible view is one of the goals of the Panorama Trail. That’s East Coyote Hills Golf Course in the foreground. (Los Angeles in the background.) But this view is only a thousand feet (about a block and a half) from the Summit House Restaurant <–click there if you would rather a shorter walk to this view. 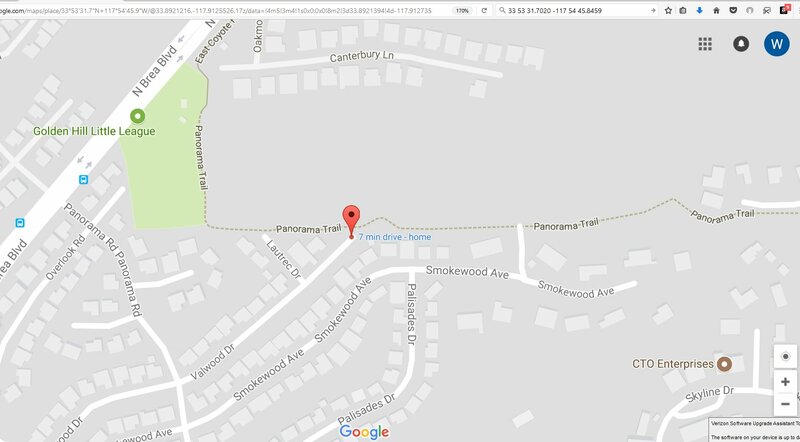 On the map Panorama Trail appears to go from Summit Restaurant on State College to Golden Hill Little League on Brea Blvd. That is . . . on the map. Turns out, the little league rarely has anything going on and thus not at all a good goal. The trail goes right on by and the only place to consider the end of Panorama Trail is Trail Rest Park at Ashford Terrace, described below as a potential park. Most of Panorama trail is a rock strewn path which is less prone to rain-caused ruts, but not comfortable for walking. 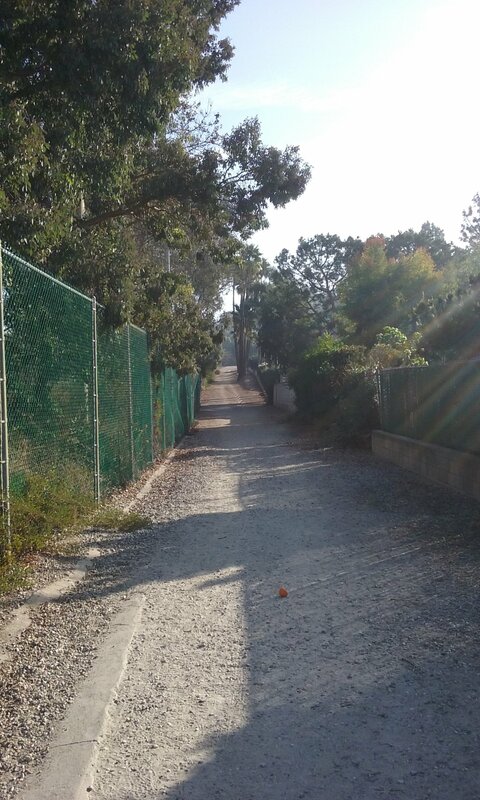 Half of the trail is in the space between back yards and a golf course. That’s the nicest part of the walk. As the path gets higher in the hills, the trail is along a street but still of rocks. It’s an unusual housing tract that has gravel for sidewalks in front of some very expensive homes. (Perhaps it is prestigious to brag about a horse trail.) The last 1/4 mile you will leave the housing tract and appreciate why its called Panorama trial. It is on dirt and has spectacular views; both south and north. There is excellent parking at Valwood Drive. From Brea Blvd, (just north of Lemon) take Longview Drive right one short block then left on Valwood Drive. Take Valwood to its end. 33 53 31.7019 -117 54 45.8459 There’s lots of parking that won’t disturb the neighbors. What follows are descriptions of the two direction you can go from there on the Panorama Trail. Going to the right on Panorama Trail the goal is the Summit Restaurant; 2.4 miles, out and back total. You will be going uphill almost from the start. 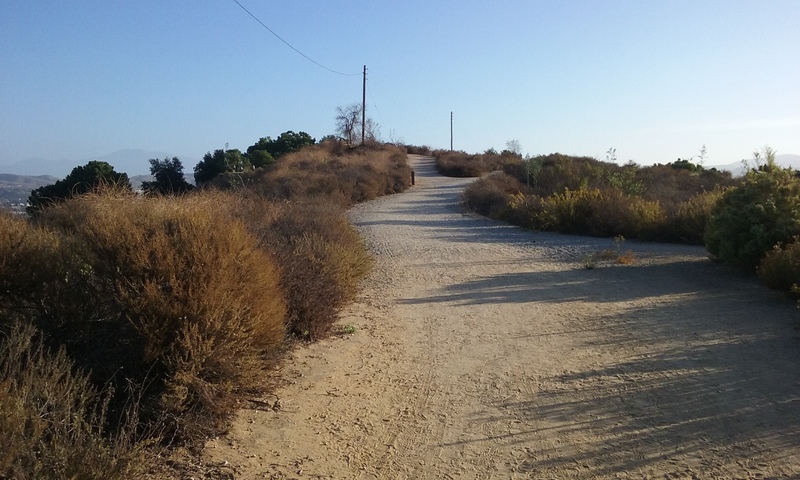 About where it is steepest, the trail becomes a kind of gravel sidewalk. When you get to a decision, choose the direction that takes you more uphill. (There is an interesting left-over piece of real estate where Skyline turns into Ladera Vista. It is a mound of dirt with a view south that the home owners association maintains.) A few hundred feet further on the trail becomes dirt (finally) as it goes through a gate that is a kind an official entrance. (It is unlikely that you will arrive this early, but the gate is locked at night and opens at 6:30 AM.) 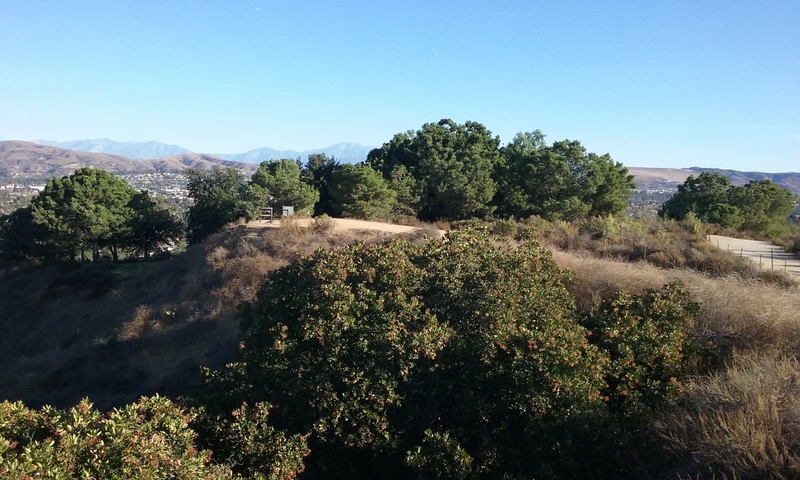 Walk about 1,000 feet further to two very prominent peaks which are the highest points in Fullerton. 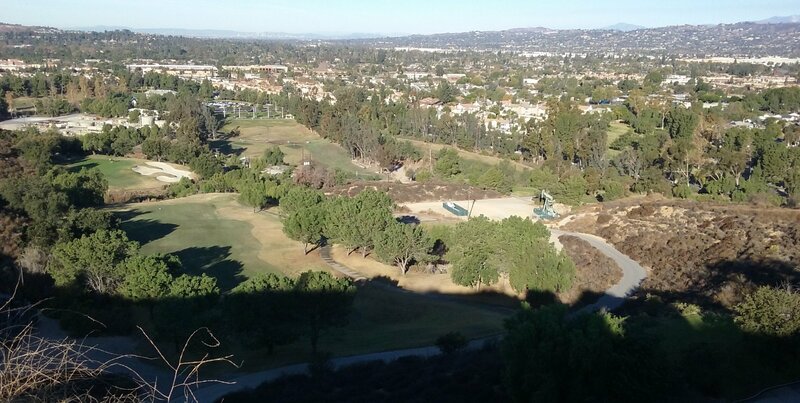 They have impressive views particularly of the golf course and Los Angeles on a clear day. The impressive views north east are spoiled by trees that have grown up with the aid of irrigation. Fullerton has be designated a Tree City. One reason is that 4,000 trees were planted and pipes put in to water them as a part of a WPA program in 1930. The almost 90 year tradition of planting trees has made cutting down trees a sacrilege. Hence the dilemma here with the beautiful threes that block a beautiful view. Continuing east you will reach your goal, Summit House Restaurant and Vista Park next to the restaurant. Look for a gazebo to the left of the restaurant. You will find a nice place to sit and wonder why the bench is there. Once again, the religion of put-trees-everywhere has blocked the view north east. You can walk down in front of the gazebo on the grass and find a clear spot between trees but you are lower where now trees along the street block some of your view. ____Across the street from where you enter the panoramic part of Panorama Trail is a view to the south. It is of a very steep canyon with city beyond. It is very green all year round and worthy of a stop along the way. Going left from where you parked on Valwood Drive on Panorama Trail your goal is Coyote Hills Horse Ranch; 2.5 miles, out-and-back total. 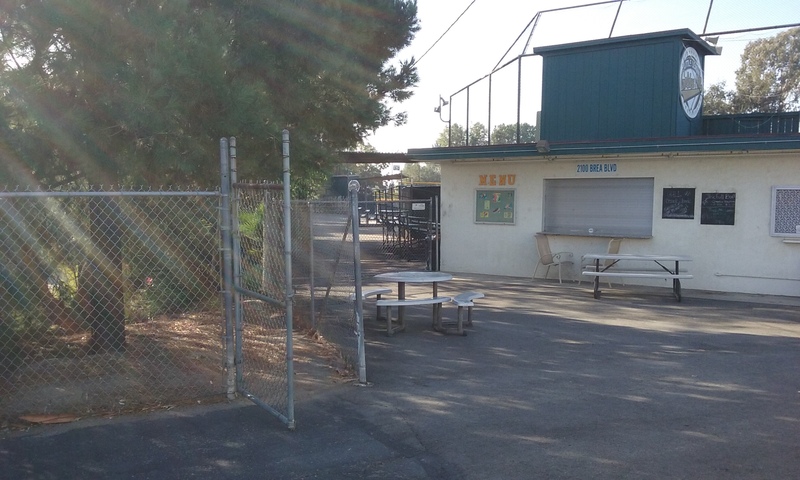 You will get very close to the golf course, then pass the Little League Ball Park. You will then be able to choose either a concrete or dirt sidewalk alongside Brea Blvd. 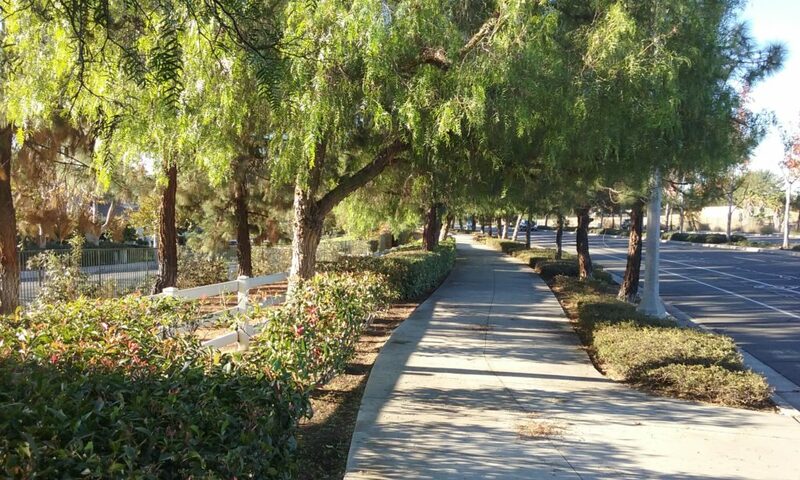 Walk a thousand feet north and then cross Brea Blvd at Ashburn Terrace. When you left the Little League Park, you were actually be on a different trail: East Coyote Hills Trail. 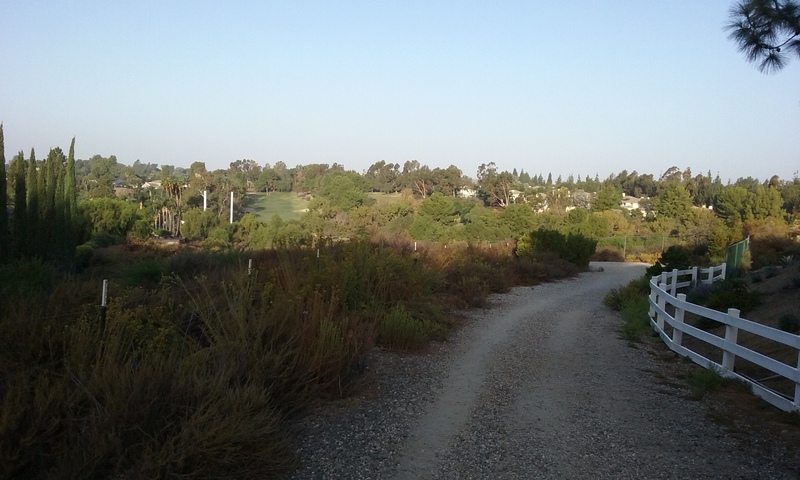 There is a webpage on East Coyote Hills Trail which has more to say about this trail and golf in Fullerton. 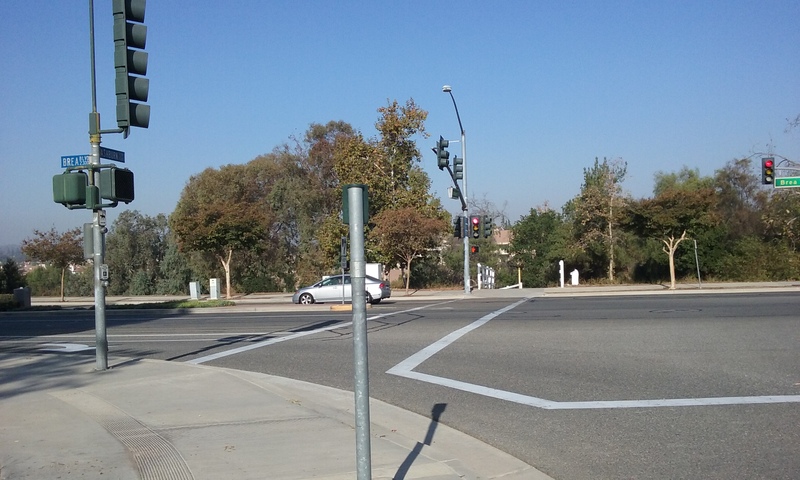 From the east side of Brea Blvd, at Ashburn Terrace, cross the street here to enter Lost Trail. On the left of the trail entrance will someday be Trail Rest Park. The Panorama Trail, at its two ends joins the East Coyote Hills Trail at their two ends making it a 2.8 mile loop. 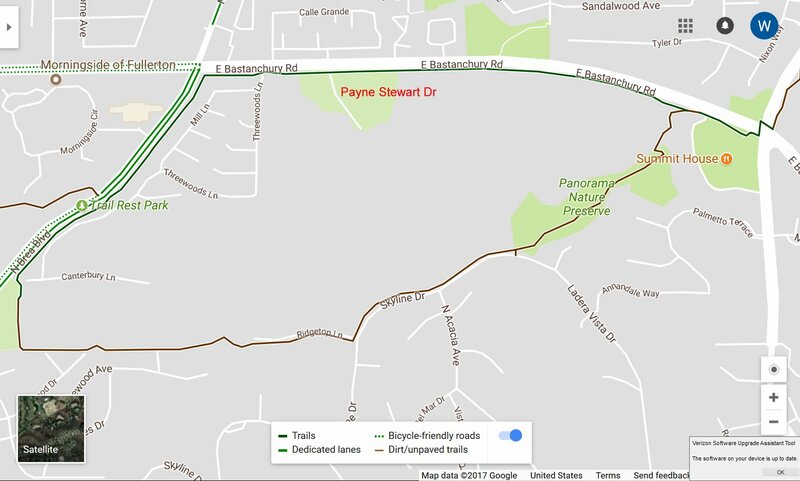 This is described in more detail in the webpage–> East Coyote Hills Trail. Notice that the loop is not much bigger than each of the out and back trips described here. Click on a picture to see it full screen . . .
For about a block between the Little League Park and Trail Rest Park, Panorama Trail (on the left) is next to a sidewalk. As you go from the Valwood entrance walking east going up hill out of the valley, look back for this view. Where Panorama Trail leads to one of two magnificent viewing spots. View of one viewing spot from the other. Notice that the trees that block the view from there also block the view from here. Looking toward the restaurant. The trail to the left is to Bastanchury where the East Coyotes Hills Trail is. Click on the map to see full screen. 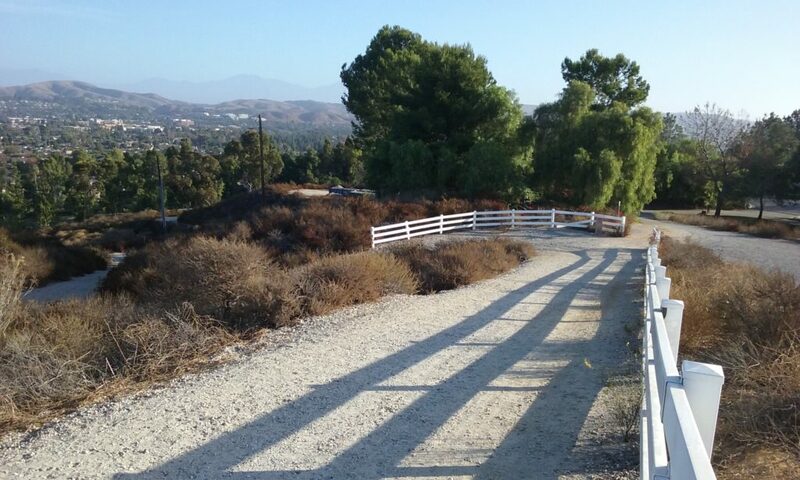 It shows how East Coyote Hill Trail completes the loop with Panorama Trail. 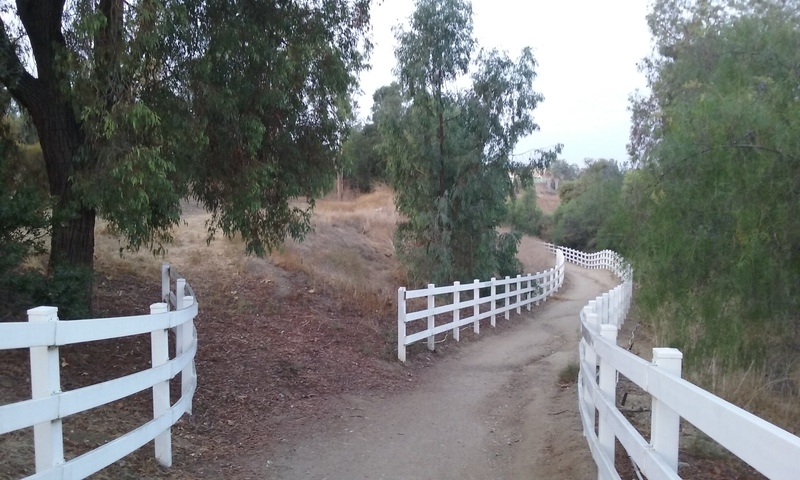 After crossing Brea Blvd, to the right is Lost Trail (to the horse ranch) and to the left is the future Trail Rest Park. At the geo-location; 33 53 32.8692 -117 54 23.5711 is a rut in a trail caused by water during a rain. They are all over the place of course but this one is of reasonable size for boy-scout merit badge project. The goal is to engineer a way so it doesn’t get worse or meander to the middle in the the next rain. This would be especially valuable to them if you let the Boy Scout define the extent and method of the repair and then budget the hours to do it in. He would then be managing the project as well as providing labor for it. Whether to do a lot or little being up to him, is as much a learning experience as the planning or doing of it. There’s a single trashcan on the Nora Kuttner. It’s half way along and it works out quite well for those that like to pick up trash and know it’s there. It works well. (It’s work better if you can put a sign at the ends of the trail to tell folks where the trash can is.) So you can put a trashcan in the middle of the Panorama too: In this case, at the end of Valwood: 33 53 31.7019 -117 54 45.8459 where it would be handy for Parks to get at the trashcan for emptying. 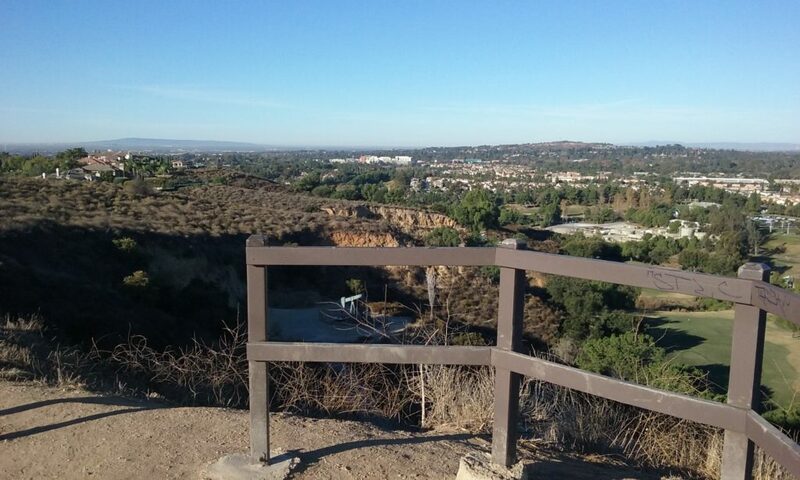 There’s a spectacular view to the south right exactly opposite where the new Panorama Park sign is on Ladera Vista. 33°53’40.6″N 117°53’58.5″W I see no reason to cut an opening in the guard rail. It is unusually low right there. But putting a bench facing south would bring attention to the spot which most people would not think to view. It is unusual because there’s houses all around, except there.